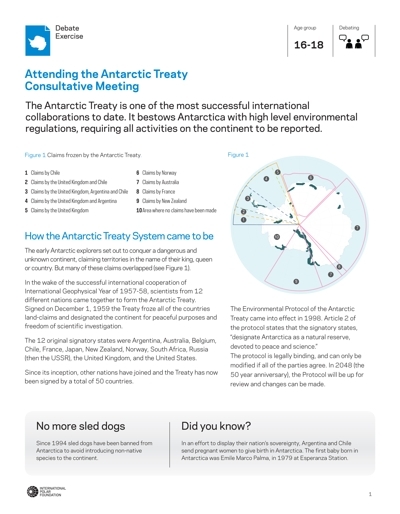 In this activity students (aged 16-18 years) learn about the Antarctic Treaty System, the very successful international agreement which governs Antarctica and has over 50 signatory countries. Students are divided into four groups and receive information about the Environmental Protocol to the Antarctic Treaty and an inspection report for a research station in Antarctica, from a real inspection which took place in 2012. The students decide based on the information they have been given, how well their station complies with the principles of the Environmental Protocol. They then presents their findings as if they were presenting at the Antarcitc Treaty Consultative Meeting in Brussels. There is then a discussion to decide which stations comply best and which require improvements.